The Millennium Falcon takes on two TIE fighters! Gallery-wrapped Star Wars artwork from Rich Davies. Canvas print measures 29-inches wide x 7 3/5-inches tall. Hand-numbered limited edition of just 195 pieces! As the sun sets and daylight fades, the Millennium Falcon takes on two TIE fighters in this striking Star Wars Dogfight at Sunset by Rich Davies Gallery-Wrapped Canvas Giclee Art Print. 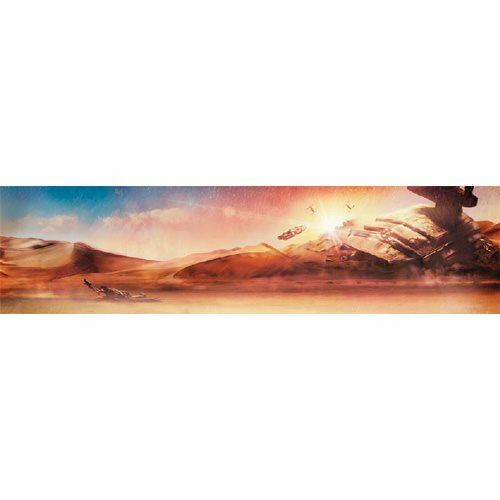 The unframed Star Wars artwork comes gallery wrapped around a 1 1/2-inch wooden stretcher bar, ready to hang on your wall (or give as a gift). It's a hand-numbered limited edition of just 195 pieces that measures 29-inches wide x 7 3/5-inches tall and comes with a certificate of authenticity.